“Chopin Bored” Chopping Board – Any fan of classical music will definitely get a kick out of this hilarious verbal play on words! 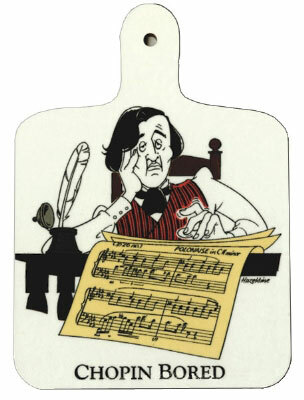 The chopping board features an illustration of the famous composer FrΘdΘric Chopin looking very disinterested. Constructed from long lasting melamine, you won’t be able to help but smile whenever you’re using this comedic kitchen utensil! This unique music gift is Made in England. Size: 14.5″ H x 5″ W.